96 years old former admiral of German army, Rudolf Arendt, sipped his coffee while recalling the day when he sank his U-bot during World War 2 off the Black Sea coast of Turkey. He said he did not hesitate after receiving the order from Berlin. 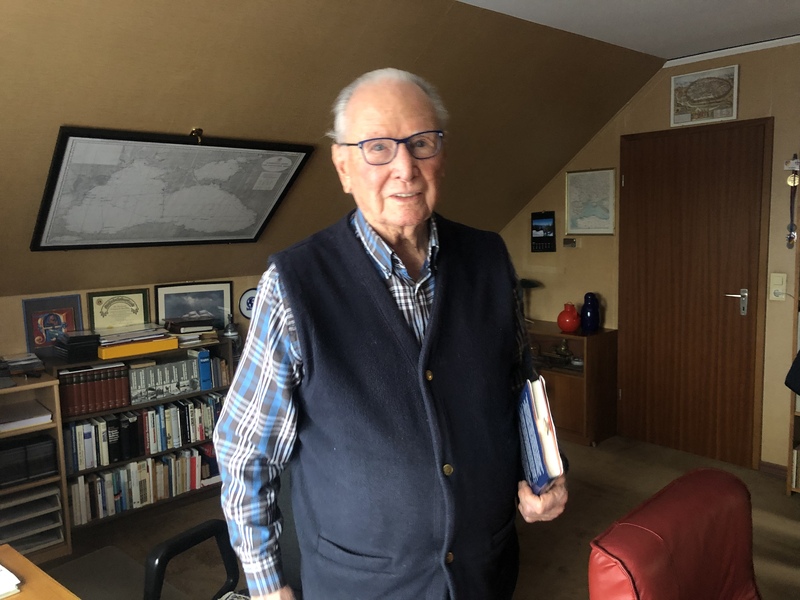 He and his 30 crew rowed ashore of rural Istanbul around midnight on September 10th 1944. They were interned by Turkish authorities and remained in what he called “little heaven” for two years. He started writing his memoirs while in Turkey. More than 70 years later, his sank U-boat has recently been found at the bottom of Black Sea by a Turkish exploration team. His priceless memoirs, however, still awaits discovery of Turkish publishers. Blue-eyed, soft-spoken Rudolf Arendt, lives his remaining life near the former German capital, Bonn. Turkish team who discovered his U-23 sent him the footage and pictures. He carefully watched the footage, perhaps to spot a familiar part on the wreckage. He still remembers some Turkish words and sayings, even after 7 decades. One certain thing he recalls is how he and the rest of the crew was treated in the hands of Turks. Adolf Hitler wrote a letter to then-president of Turkey, Ismet Inonu, to assure him that Germany had no intention to violate the Turkish sovereignty, according to Arendt. Admiral Rudolf Arendt says he did not hesitate carrying out the order to sank his U-23. It was a successful mission since none of his sailor were injured. Arendt and the rest of the German soldiers were kept in Turkey for two years. He says they realized how rightful their choice was for sinking the U-bots at Turkish waters. “Turkey was a little heaven for us at that time. Prison camps in Russia were in dismal conditions and we lived in the best conditions we could hope for in Turkey,” the 96 year old stressed. He also pointed out that Turkish army staff protected them from American soldiers when they were taken to Italy. “American soldiers were confiscating valuables of German POW’s. Turkish commanders did not let Americans to touch us,” Arendt said. The former German admiral started writing his memoirs while in Turkey. He took notes every single day and publish them decades later. His book called Last Command:Sink awaits to be sold on the internet platforms. But Rudolf Arendt hopes his memoirs would be translated into Turkish and published one day. He reminds he is 96 and may not have enough time to see that happening. But hopes that discovery of U-23 would bring fresh attention to it.